Discussion in 'Apple Watch' started by Unconsoled, Nov 5, 2014. I was wondering if anyone had any insight from the information we know currently regarding running with an Apple Watch. I know it does not have it's own GPS. Is there another way it could measure distance? I do not run with my phone, especially now with a 6 Plus. Does the accelerometer or motion chip calculate distance? Seems odd to have a sport version that has all those sensors but not GPS. I know we don't have a ton of info yet but was wondering if someone has seen something about this. The waterproof aspect and running or cycling is something that's also yet to be addressed. I've set out for a cycle when it's seemed dry, got half way round my route, in the open countryside and the heavens opened up, likewise could and I guess often does happen to runners. Rain hammering down, no place to shelter, just had to keep going, and totally and utterly soaked thru to the skin. So does that mean my $349 to $4000 Apple watch is scrapped? I think we all hope not, and hence we need VERY clear guidance from Apple as to how waterproof it is. If you can't shower in it, then you can't use it for outdoor sports either, unless you are going to carry a waterproof bag with you at all times to take it off if you get caught in heavy rain, which people do all the time. Just saying, don't get it too wet, but a little should be ok, is no good. Apple are generally pretty arrogant when it comes to other people's ratings and standards, thinking they know better, but this is industry standard and it's something others will work to and IMHO so should they so people understand. You can't accurately determine distance using an accelerometer and I don't believe the Apple App will even try. Some 3ed party Apps may give it a shot but you are probably looking at +/- well over 10%. Here is a thread you may want to read through speculating about running and GPS. Yeah, I hate to say it but this thing is useless for runners. It's got to have a GPS. If I still have to take my phone with me on runs, why bother with the watch at all? I'm thinking about buying a Microsoft Band, as that is what I really wanted the Apple Watch to be in the first place. I'll look at Apple Watch 2.0 though, and hope that Apple makes it more runner friendly. I currently use a Fitbit Flex and strap my iPhone to my arm while running for the GPS. I'd love to just wear something on my wrist and leave the phone at home. I have been carrying my iPhones on runs since the Original (for music and GPS backup tracking) using a pack. The advantage is you will be able to see your metrics and control pauses/starts/laps/music from your wrist which you can't easily do with the iPhone. I will still use my Garmin 620 for a while too but very excited about using the aWatch for running/biking. Thanks for the insight everyone. Less concerned with it being waterPROOF. Water resistant is fine for me. My Nike+ GPS watch is water resistant and it is fine. I think we will see something similar to the Microsoft band. Nike has already said they are working with Apple on fitness devices. Just wondering if the old Nike sensors you strap to your shoes will work. I don't mind being a little off on accuracy. I have been looking at the Microsoft Band pretty hard but then watched the Apple Watch films again and it is more functional for everyday use for me. The running part bums me out if we have no way to do that but I will still use my GPS watch. The Nike sensor is a pedometer (accelerometer) for measuring cadence and stride. In order to accurately measure distance you MUST use GPS. Here is a 6.1 mile run I did but using the iPhone's accelerometer/Nike+ App (verified using my Garmin 620 and a well known route). It is 25% long (wrong). Does that meet you definition of "...don't mind being a little off on accuracy..."? Also the aWatch will be water tight fine used in almost any type of sporting event except probably swimming. I don't think the Apple Watch is really targeting runners. The smartwatch category (e.g. Pebble) is distinct from the activity tracker category (e.g. Microsoft Band or Fitbit). They overlap in features but are not the same. The aWatch is targeted to 3 groups. Don't believe Apple is targeting runners? Apple has already made a promotion film ABOUT runner's and the aWatch. Here is the link on the Apple Watch site titled "Health and Fitness" that IS mostly about running with the aWatch. Don't believe Apple is targeting runners? Apple made a promotion film ABOUT runner's and the aWatch. Here is the link on the Apple Watch site titled "Health and Fitness" that IS mostly about running with the aWatch. Granted. But I think Apple is doing a little bit of throwing things on the wall to see what sticks. The wearables market is new, and Apple is really sure what's going to work. There are far better products for athletes than the Apple Watch already. Granted. ... There are far better products for athletes than the Apple Watch already. Sure but that is not what you said. Also with the iPhone's GPS and extra accelerometer Apple has most sensors that sport watches have. Granted I will not be sold on the optical HR sensor (you could still use a BT HR strap[App supported]) until I have at least a couple of months data to directly compare to my Garmin 620. The aWatch also has advantages like a real time map display. Most sport watches and other fitness tracker just record the GPS data. In a gen or 2 the aWatch will likely have GPS and maybe 3G (for map data). I think you might be partly right. Nike CEO recently hinted that Apple & Nike might be working together on fitness wearables. I wonder if Apple considers it 2 separate products a smart watch and fitness band? Put too many fitness type sensors into smart watch and no point in the band. There goes my plans to use it to improve my lap time. Figured all I'd have to do is shove my iPhone in my speedos and wear the Apple watch. Oh well. Guess if one didn't die in the water, the other one would. Either way, the Apple watch would be useless for training. ...Nike CEO recently hinted that Apple & Nike might be working together on fitness wearables. I wonder if Apple considers it 2 separate products a smart watch and fitness band? Put too many fitness type sensors into smart watch and no point in the band. Nike could be working on sensor imbedded technology to be connected to the aWatch. The aWatch is Apple vision of the center for health & fitness tracking. Nike might offer shoes that could measure things like ground force, contact time, stride length, vertical oscillation,... and clothing that could sense sweet, body heat, contact, G-forces, .... all reporting back to an aWatch App. I actually utilize a Pebble watch, Polar H7 heartrate band, and my iPhone 5S to do all of this during my running, biking, and weight training using iSmoothRun. Not having to pull out my phone in order to see pace, distance, heartrate, cadence, etc. has been a godsend. I use a Garmin handlebar mount to strap my Pebble to the handlebars. And now that Pebble watches start at only $99, it's well worth the investment. Only reason I'm ready and eager to get the Apple Watch is the better integration with iOS/OSX that is sure to happen. What cadence sensor do you use to show the cadence on your Pebble? 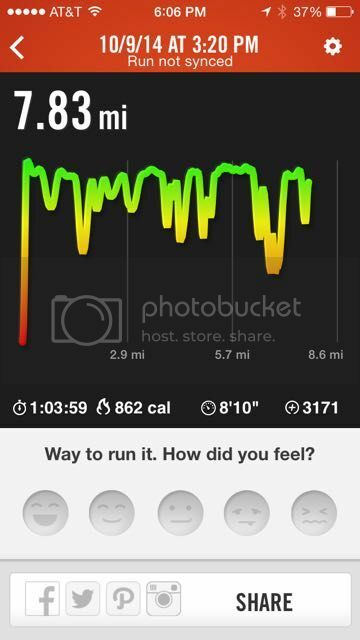 Cadence is actually built into iSmoothRun, the app I use for all of my fitness tracking. The developer of iSmoothRun developed a watchapp for the Pebble that allows you show whatever metrics you would like. I have three different pages created. One showing pace, cadence, and HR, one showing time, distance, and HR, and a third showing speed, distance, and HR. I use the third for cycling. If you have a footpod, you can link that into iSmoothRun and it will show the information on your Pebble. Go here: http://www.ismoothrun.com/blog/index.php and look at the post from March 10, 2014 to see what I mean. There were a couple bugs introduced once iOS 8.1 came out, but the developer has always been very good about squashing them quickly and effectively. I haven't run into anything that detracts from my use of the app though, just a couple nuisances. I'm wondering who is going to run or otherwise game/exercise, with a leather or other fancy watch band, that could get ruined by sweat or rain. Are you runners planning on getting sport rubber bands and/or the Sport model watch? I plan on buying the Sport and maybe one extra Sport (fluoroelastomer) band. I also plan to buy a leather (maybe 3ed party) band also. Leather would of course not be good because sweat is acidic and salty (rot/stink). However the publicity pic is a Stainless Steel 316L band and it's extremely durable. It would drive me CRAZY running with metal links bouncing around though. So how can it do cadence if you don't have a sensor? If you get the Apple Watch (not the Sport version), then you can switch out the metal band to the sport band. So to answer your question, maybe some people but some people will just switch out the band like I will. If you are seriously hoping the Watch can replace your 620, I think you will be very disappointed. The Watch is, at best, ok for casual fitness use. However, if you want a device that will truly enhance the effectiveness of your workouts, it will be tough to beat the 620, or even something along the lines of the Forerunner 220. The Watch can't hook up to ANT+. It isn't waterproof. The display's readability is yet to be determined. The apps will take time to mature to something truly usable. Look at iPhone apps for workouts. While good, they still can't replace dedicated devices after years of development. If you just want something that will track where you went, put it on a pretty map and allow you to post your wonderful workout accomplishments to Facebook, then MAYBE the Watch fits. Of course, then i would have to wonder why on earth you ever purchased a watch such as the 620 when something like the Forerunner 10 or 15 would have accomplished the same goal for much cheaper. At the moment, the Watch is a solution in search of a problem. A device in search of a market. Apple is throwing 3 ideas against the wall, notifications, fashion, and fitness, and hoping one of them fits. To me the weakest, and least developed idea, is fitness. Sweat and abuse is another reason the whole idea just doesn't seem to work. This "fashion piece" is what I am going to take out into 100 degree heat so I can sweat all over it? I can do that with my fenix 2 because when I am done, I run it under water and it is good as new. Will that work with the Watch? Will the materials clean as easy? I doubt it. It seems the fitness aspect runs counter to the fashion and notification ideas. You quoted me but obviously didn't read what I wrote. I clearly started that I will still use my Garmin 620. I didn't say anything about replacing my 620 with the aWatch. I have been using sport monitoring watches for over a decade (2004) and often use more than 1. I believe in a gen or 2 the aWatch will be a suitable replacement for most sport watches. I also believe it will be much more suited for sporting activities than you indicate. Cook is an avid health nut and will insist on it being competent for activity use. Also Apple wouldn't promote it in this fitness film if they we not confident in the aWatch's ability to weather working out. It will certainly be water resistant, not waterproof. Sweat will be no problem. Also, no GPS as of yet, but I hopeful Apple will change their mind as nothing is finalized until it's released. Because there is rhythmic movement in running. Same way any pedometer works. It's pretty simple.